Ear drops can be used to treat or prevent ear infections or to help remove earwax. Ear drops may be bought over-the-counter or prescribed by your doctor. They’re typically used for short-term treatment. No matter what kind of ear drops you use or why you use them, it’s important to administer them correctly. Using ear drops properly allows the medication to enter your ear canal and treat your ear problem. Here are the step-by-step instructions on how to use ear drops properly and safely. Along with your ear drops, you’ll need hand sanitizer or soap and water to clean your hands. You’ll also need some tissues or a towel to wipe away excess drops that drain out of your ear after applying the ear drops. These instructions can help you put ear drops into your own ears. If you’re a parent or caregiver, follow the same steps to give drops to a child or another person. If you have trouble putting drops into your own ears, ask a family member or friend to follow these steps to help you. Gather your supplies. These include the bottle of ear drops and a tissue or other cloth to wipe away any drips. Wash your hands with soap and water. If water is not available, use hand sanitizer instead. Warm the ear drops by holding the bottle in your hand for one to two minutes. This can help reduce any discomfort that could be caused by cold drops in your ear. Remove the cap from the bottle. Place the cap of the bottle on a clean, dry surface. For bottles with a dropper, check that the dropper is clean and not cracked or chipped. Position the head so that the ear faces upward. If you’re giving the drops to yourself, it may be easiest to sit or stand upright and tilt your head to the side. If you’re giving the drops to someone else, it may be easiest if the person tilts their head or lies down on their side. If the bottle has a dropper, draw some liquid into the dropper. If the bottle has a dropper tip, you’ll just need to turn the bottle upside down. For adults, gently pull the upper ear up and back. For children, gently pull the lower ear down and back. 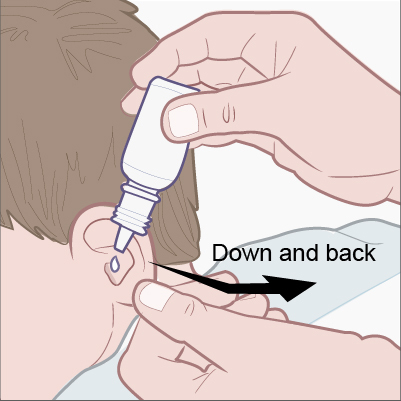 Squeeze the correct number of drops into the ear. Your doctor’s instructions or the bottle’s label will tell you how many drops to use. Gently pull the earlobe up and down to allow the drops to run into ear. Keep the head tilted for about two to five minutes so the drops can spread into the ear. Wipe away any extra liquid with a tissue or clean cloth. Store the bottle as directed by the label or by your doctor or pharmacist. Don’t use a dropper that’s cracked, chipped, or dirty. Don’t allow the dropper tip to touch your ear, fingers, or any other surface. It could pick up bacteria or other germs that can lead to an ear infection. Don’t warm the drops under hot water. They may become too hot and hurt your ear. Don’t share your ear drops with anyone else. Sharing drops could spread germs and infection. You should also know how long you can use the ear drops safely after opening the bottle. For prescription ear drops, ask your pharmacist or doctor about the expiration date. For over-the-counter drops, check the expiration date on the label. If the drops have expired, throw them away. Don’t use expired ear drops. To help your ear drops work well, follow these instructions and any directions from the label or your doctor or pharmacist. These steps should help you use your prescription or over-the-counter ear drops easily and safely. If you have any questions about using your ear drops, ask your doctor or pharmacist. My ear hurts after putting in my ear drops. What should I do? Some ear drops will make your ear burn or sting when they’re first put in. Typically, that’s not a cause for concern. However, if the discomfort doesn’t go away in 10 to 15 minutes or if it keeps getting worse, you should call your doctor. You should also call your doctor if you have any swelling in your ear after you use the drops.